Good drainage is crucial for growing many garden plants. 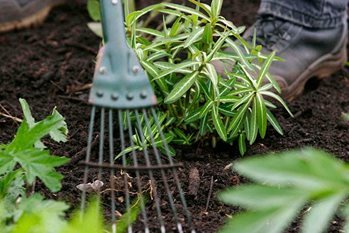 Installing drainage is a major undertaking, but on wet soils, it is one of the most helpful things a gardener can do to improve growing conditions. Drainage is important for gardens, but not every garden will need drainage installed drainage. If you are considering installing drainage, think about where the water to go. Ditches, streams or soakaways (deep holes filled with rubble that penetrate to porous rocks) are all suitable. Local byelaws usually prohibit adding drainage water from gardens to sewers or storm drains. Where there is nowhere for water to go, consider growing in raised beds, or perhaps consider a bog-style garden. Installing drainage involves burying porous pipes at about 45cm (18in) deep. This is very disruptive and is difficult to accomplish when the soil is wet. The best time for this type of ground work is from late summer until early winter when ground conditions are usually driest. Look for surface puddling after rain which normally indicates compacted layers beneath the surface. Be aware that natural springs may occur and need piping away. Also broken pipes may cause wet spots until mended. Pour water into a 30-60cm (1-2ft) deep hole and cover to exclude rain. If water remains for hours or even days the soil may benefit from installing drainage. Before going ahead and installing a drainage system, consider if normal cultivation methods might be all you need to improve drainage. This is often the case for old, established beds and borders that may have become compacted over time. In this case, consider digging (or rotovating) the beds and adding organic matter. See our advice in soil: cultivation for more information. In some cases, digging ditches about 90cm (3ft) deep with sloping sides across the lower end of a slope will be enough to take excess surface water. You may need to hire a small pedestrian controlled trenching machine for this. Where open ditches are unsuitable, French ditches can be constructed by filling the ditch with coarse gravel topped with permeable membranes or upturned turf to keep soil from entering the gravel. Finally finish with topsoil. Severe drainage problems require piped drainage where perforated plastic pipe laid in trenches on a firmed 5cm (2in) bed of coarse gravel and covered with 10cm (4in) of gravel. Designing and installing piped drainage on a large scale is skilled and heavy work and is best accomplished by landscape or specialist contractor. Be sure to avoid cutting pipes and cables when trench digging. It can be difficult to lay pipes with sufficient enough fall for water to drain away. In this case consider installing electric pumps and float switches. Another common problem is finding a place for water to go. It may be possible to work with neighbours or other local landowners to find an outfall for surplus water. It is rather anti-social to dump surplus water at the lower end of your property to flood neighbours gardens. However in some circumstances a seasonal pond or swale might be the solution.